I have another podcast review over at Just One More Book, which is a great site for learning about picture books and loving the genre. And they are welcoming to anyone submitting their own reviews of picture books. So, go ahead: give it a try — you can send them a written review, an MP3 review or even call their special phone number and leave your review on their answering machine. 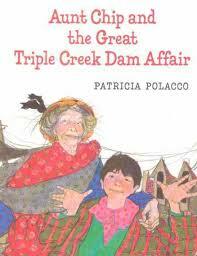 This time (which I guess is now my fifth review there), I reviewed Aunt Chip and the Great Triple Creek Dam Affair by Patricia Polacco — a book that deals with the idea of books and literacy in a very interesting way. I love the ending, in particular, as the children lead the way to literacy. Go to Just One More Book to hear my review. I have no idea what practical use this application might have, but TagGalaxy allows you to use tags from Flickr to create an entire world of photos. I used the photos from our collective PhotoFridays project (launched by Bonnie to great success) and, although there are not quite enough photos there yet to cover the entire TagCloud world, it was still pretty neat. I used screenshots to capture the PhotoFridays TagCloud because I can’t find the way you might embed the actual world into a blog. But you can do it yourself. Just go to TagGalaxy, write in the tag “photofridays” into the prompt and give the world a spin. I think it will be cool to come back and do it again later this summer, when the pool of pictures gets larger. This is part of a Photo Fridays project over at Flickr that is overseen by Bonnie. You are invited to come on in and add your photos to the collection. This is Coltrane, my cat (named after the legendary jazz saxophonist John Coltrane). I was taking a photo of something else entirely when he poked his nose right into the lens of the camera. I kind of like it. It sort of looks like he has a milk beard, doesn’t it? But that is just the flash of the camera dancing off his face.